Each player starts the game with two decks of cards: a wall deck and a tower deck. Each card allows a player to play the components shown on it, with the wall deck cards always depicting at least one wall (and some combination of walls/towers) and the tower deck cards always depicting at least one tower (and again some combination of walls/towers). On a turn, a player can play as many cards as she wants, but she draws only one card at the end of her turn. The goal is to create courtyards – and subdivide existing courtyards – while keeping your opponent from doing the same. Players have the same cards in their decks, so the challenge is all about what to use when. The game ends when all the castle pieces are used up, and the player with the most points wins. 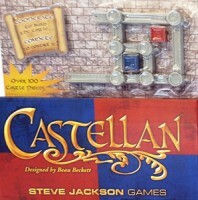 Add a Review for "Castellan"